Wipaq provides the best of solutions for a high intensity traffic zone where security is always a risky part. By installing their waist high turnstile lc100, you can keep the worry at bay. Its portable built is the icing on the cake as it can be shifted to multiple locations without having to buy a new one every time you open a new gate. Sturdy and compact, it can withstand any rough daily usage. 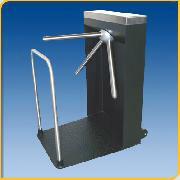 The LC 100 Portable turnstile body has been designed with sleek, modern looks to fit today's world. The main body is constructed from 10 gauge carbon steel with a ¼" thick base plate. Both are protected with a tough industrial-grade black powder coat finish (custom colors or Satin-stainless available). The top cover is made of type 304-brushed stainless steel. The portable feature includes a 5/16" thick diamond tread plate with an industrial powder coat finish (also available in 304 Stainless Steel). A 304 satin stainless steel guide railing is attached to the plate to create a passageway. This portable unit comes with a pair of wheels for easy relocation of the turnstile.